Wow, it’s that time of year again and the good ole British summer is finally upon us, and in typical British fashion, it’s raining! Thankfully British summertime is gifted by a deluge of summer music festivals and other summer events around the country that are sure to keep everyone happy whether the sun is shining or the rain is falling. Festival events such as Glastonbury or V-Festival offer a great opportunity to dress to impress with a funky outfit finished off with a great pair of stylish sunglasses (or perhaps a stylish pair of wellies). Obviously being in the eyewear industry we are particularly interested in what sunglasses to wear to a major summer event that will not only help you to look uber cool but will also do a fine job of protecting your eyes from damaging UV rays from the the harsh summer sunshine (and even if it’s cloudy). 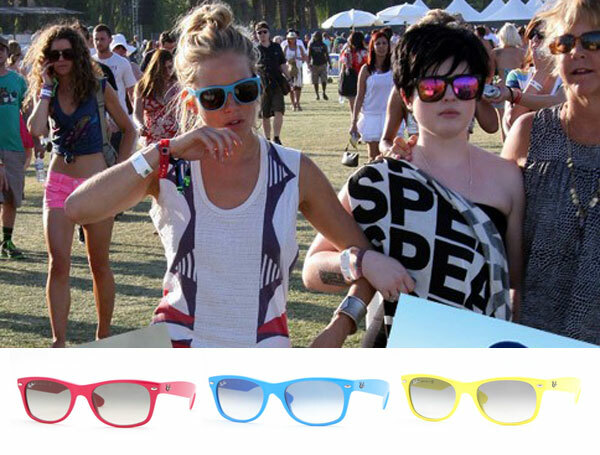 Everyone’s fashion tastes are different but the most obvious style to wear for your typical music festival event is the the classic festival eye wear of choice, the Retro style. Big on statement and bold on colour! 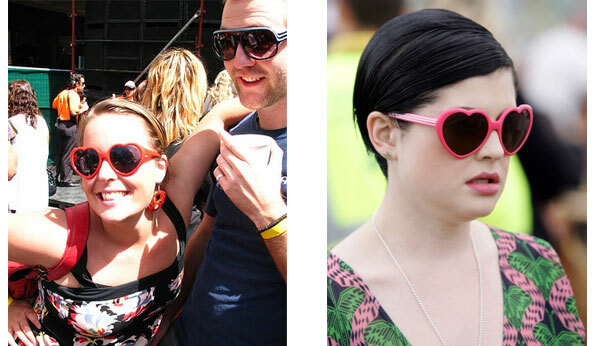 Not only are bright vivid colours the order of the day for festival goers, sunglasses with a slightly different shape to the norm could also be considered worthy festival wear, take these heart shape glasses for example. 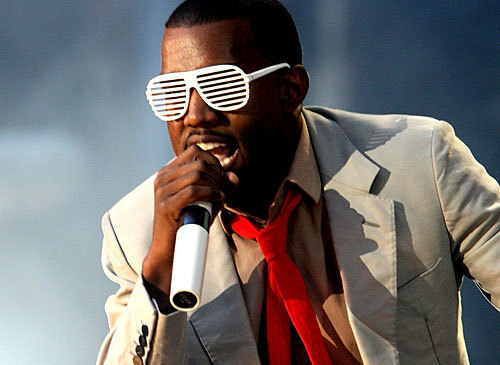 Made famous by Kanye West his Summer 2007 music video, Stronger, these Shutter or Grill styled shades are still popular today and are bound to be sported by many at a festival near you this year! These shades may look cool but as they don’t have lenses they offer no protection whatsoever against UV damage. Finally, here are some other great examples of retro or funky styles that you may want to consider for a festival this year. Not sure the Retro / Funky style is you? No worries! Next time we will be taking a look at a selection of oversize / Bug-eyed styled sunglasses that are perfect for summer festivals, followed by the iconic aviator style. Check back here later for new blog posts! Looking to buy a pair of Retro / Funky style Sunglasses? 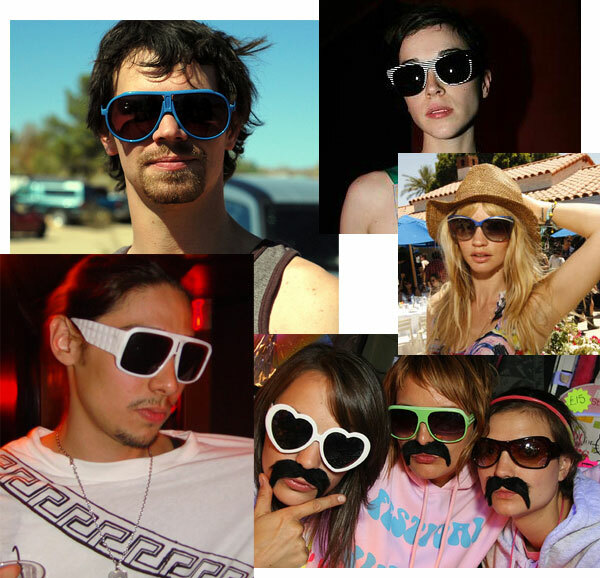 We are listing a unique selection of sunglasses we think will make a perfect accessory for any reveler attending one of the great summer festivals of 2009. So if you’re heading to Glastonbury or V-Festival, why not check out our recommended choices and more at our Fashion Sunglasses for Summer Festivals area.